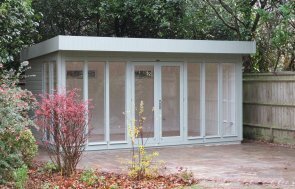 All our studios are available in a range of sizes, with this one measuring a spacious 3.0 x 3.6m. 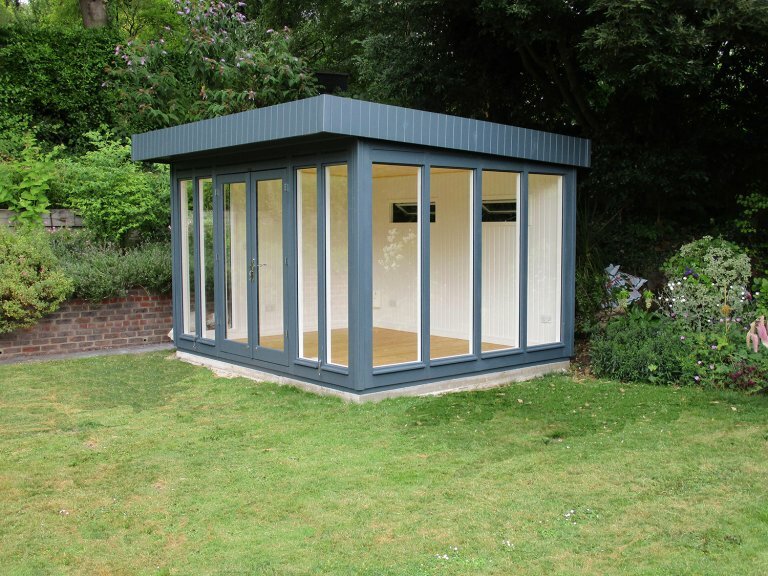 It has a pent roof covered with heavy-duty, heat-bonded felt and the exterior is clad with smooth shiplap painted in the exterior shade of Slate, selected by the customer from our vast range of colour options. 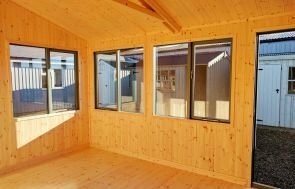 Internally, the studio boasts insulation and lining in the walls and ceiling as standard, with the option to upgrade to full insulation and painted internal lining if you wish. The customer here chose to upgrade and this gives her a building that she can use straightaway as well as a year-round retreat at the bottom of her garden. An electrical pack has also been installed with the building, which allows lighting and appliances to be used inside the building, also extending its use into the darker and colder months. The floor boasts a natural lacquer to offer protection and enhanced durability against frequent footfall, and the fully-glazed windows all boast double glazing. 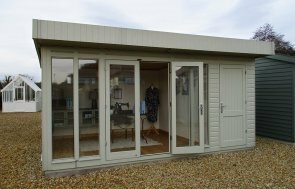 In order to browse our selection of Garden Studios, we suggest that you pay us a visit at your nearest showsite to see them for yourself! With several based across the country, our show sites offer up to 25 different display buildings and a team of friendly advisors on hand to help. Most of our centres are also based at Garden Centres so that you can enjoy a day out and gather inspiration from the local produce. Locate your nearest one here. Alternatively, you can get in touch with us to discuss your dream building.